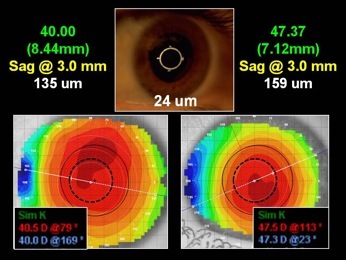 It is well established that insights into the sagittal height of the anterior eye can be helpful in the fitting of both custom soft and scleral RGP lens designs (Figure 1). 1. The central radius of curvature (approximately 3.0 mm) of the central cornea. 2. 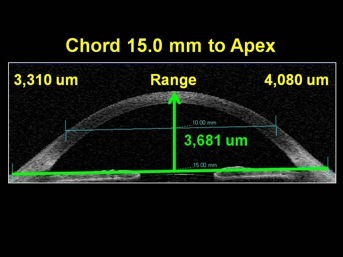 The mid-peripheral corneal eccentricity, which extends from the apex of the cornea to a chord of approximately 10.0 mm. 3. The overall corneal diameter. 4. The corneal angle that begins at the 10.0 mm cord and extends to the limbus. 5. 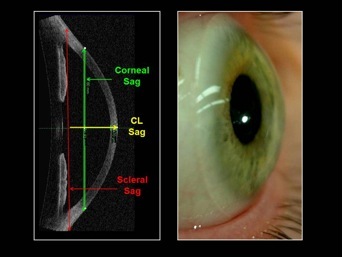 The scleral sag that begins at the corneal diameter and extends down to any given chord, i.e., 13.0 to 20.0 mm. In a study of 55 normal eyes at Pacific University, we showed that, at a chord of 15.0 mm, the average sagittal height of the eye was 3,681 microns, with a range of 3,310 to 4,080 microns (Figure 3). 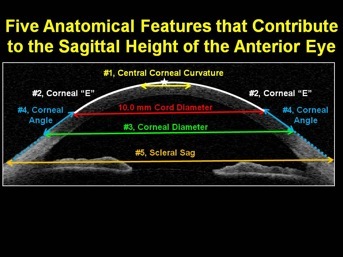 Armed with this information, let’s evaluate the contribution that each of the above features has on anterior segment height and see how normal variation in the population may affect overall sagittal depth. 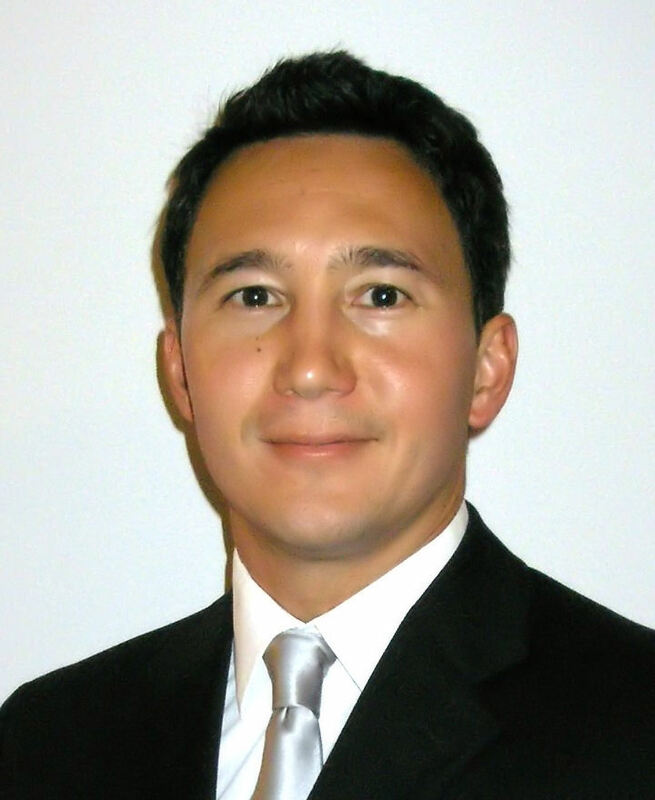 In this first part of a series of three, the role of central corneal radius, corneal eccentricity and overall corneal diameter are evaluated. 8.44 mm radius on the overall sagittal height of the eye (3,681 um) is 135 um. 7.12 mm radius on the overall sagittal height of the eye (3,681 um) is 159 um. This represents a difference in sagittal height between the two eyes of only 24 microns. Therefore, using keratometric readings in the fitting of any contact lens design in which sagittal height is critical (i.e. soft contact lenses or RGP sclerals) is inappropriate. Over a range of normal corneas, the central 10.0 mm of the eye contributes approximately 1,743 microns (range 1,580 to 1,940 um) to the sagittal height of the eye. As with central radius of curvature, changes in corneal eccentricity contribute very little to differences in the sagittal height of the eye. This fact is illustrated in Figure 5, in which three corneas (all with an apical radius of 7.95 mm (42.50 D.) are represented with three different eccentricities. The difference in sagittal height between the low “e” (0.28) and the high “e” (0.84) was a minimal 107 microns. Topographical studies at Pacific University have shown that in normal (non-diseased) eyes, the cornea is indeed curved (prolate) throughout a chord of 10.0 mm. However, beyond the 10.0 mm chord, the cornea loses its curvature and forms a tangent (straight line) that extends from 10.0 mm to the limbus and throughout the anterior sclera (Figure 6). In a 2013 study of 100 normal eye subjects (50 random right eyes and 50 random left eyes), we found that the average corneal diameter was 11.8 mm, with a range from 10.9 to 12.6 mm (Figure 8). 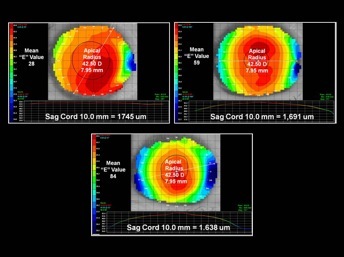 Over a normal range of corneas, the overall diameter contributes approximately 2,400 microns (range 1,960 to 3,000 um) to the sagittal height of the eye. As a general rule, smaller diameter corneas exhibit less sagittal height, and conversely, larger diameter corneas exhibit greater sagittal height. This is clearly illustrated in Figure 9, which shows small, medium and large, corneal diameters. 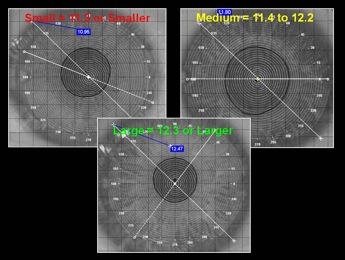 The difference in sagittal height between the small diameter corneas (11.3 and smaller) and large diameter corneas (12.3 and larger) can be fairly significant, approximately 1,000 microns. 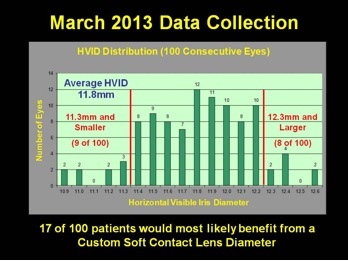 This begs the question…do larger diameter corneas always exhibit greater sagittal height than smaller diameter corneas? 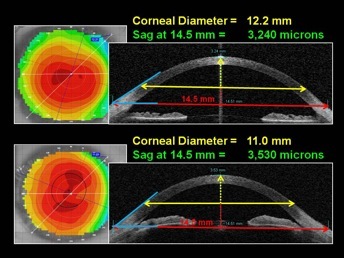 NOT ALWAYS…in that other factors such as apical radius and corneal/scleral eccentricity can off-set the influence of corneal diameter. This is illustrated in Figure 10, in which a larger diameter, 12.2 mm cornea exhibits a sagittal height (at a chord of 14.5 mm) that is 290 microns less than the smaller, 11.0 mm cornea. 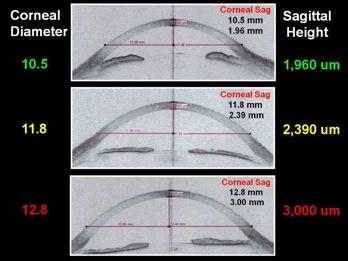 While there is a fairly strong correlation between small diameter corneas contributing to shallower sagittal depths and large diameter corneas contributing to deeper sagittal depths, there are far too many exceptions for this parameter to be a reliable indicator of sagittal depth. Where corneal central radius of curvature, corneal eccentricity and even diameter have proven to be poor indicators of overall sagittal height of the eye, there may be another indicator that can prove to be a better predictor. 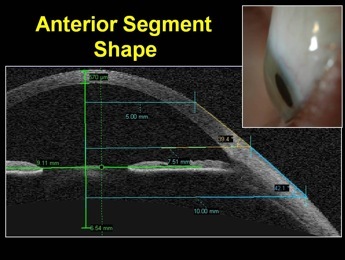 In the second part of this trilogy on soft lens fitting and ocular surface shape, the role of the peripheral corneal angle is evaluated, as a possible predictor of overall sagittal height.